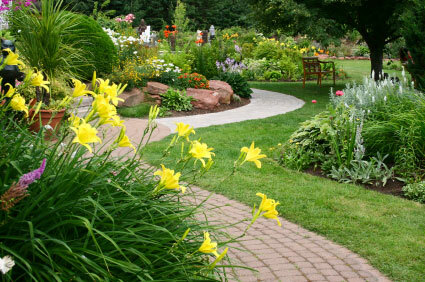 Our walkway ideas, pictures and information will give you plenty of ideas for your front yard, front porch, and home. Walk ways are extensions of your porch and home and if designed, constructed, and landscaped well, they will add immense aesthetic value to your property. You will be thrilled with all the options you may have; use our guides, tips, and ideas for creating your own curb appealing entrance. 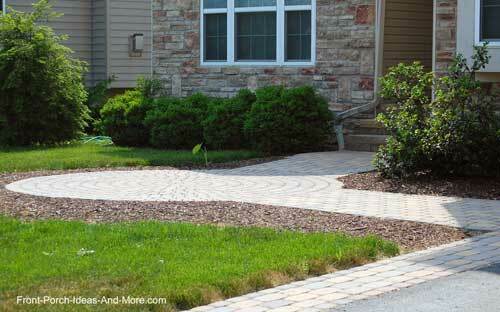 Interesting and intriguing walkway designs, like a winding brick or flagstone path, they can be very charming. The right material can soften the appearance of a symmetrical home or could make a Cape Cod appear more formal. Just like your front porch railings and columns, the materials you choose can also reflect personality or creativity. 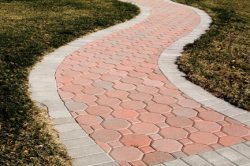 From stained or stamped concrete, pavers, flagstones, brick or mulch to recycled materials, you have a wide variety to choose from that will complement the style of pathway you build. The walkway in the photos below are not only imaginative but also make a focal point for the landscaping to come. Walk ways don't have to be boring! Walk ways don't have to be straight either. A little jog makes them more interesting. 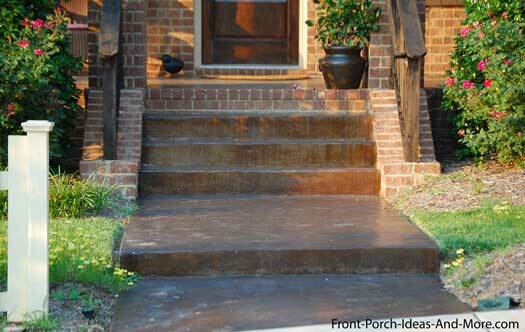 Beautifully stained concrete steps and walkway. Although this appears to be grass in between the stepping stones, we like the idea of ground cover in between the rocks. Makes for a natural path that blends in beautifully with the landscape. Certain ground covers are suited for this application. 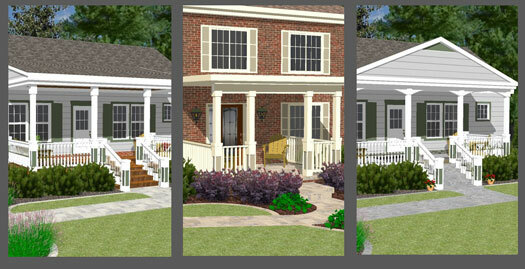 Use our Front Porch Illustrator to see how walk ways affect the overall appeal of the front porch and home. 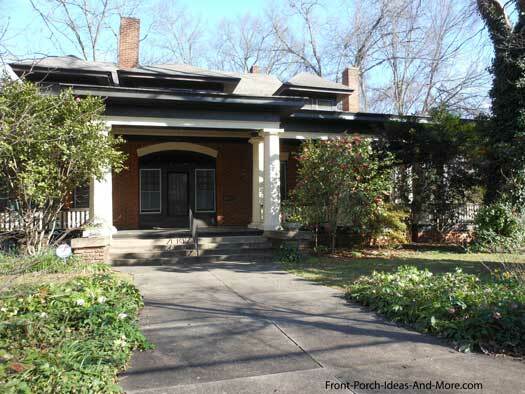 We show both a one-story and two-story home with over 30 different styles of front porches. For some a walkway is only a means to get from one end to the other. For most of us, however, it can be a lot more. Create intrigue - A curved walkway that disappears behind shrubbery or hedges, for even an instance, can lend itself to a little intrigue. What object or destination lies ahead? 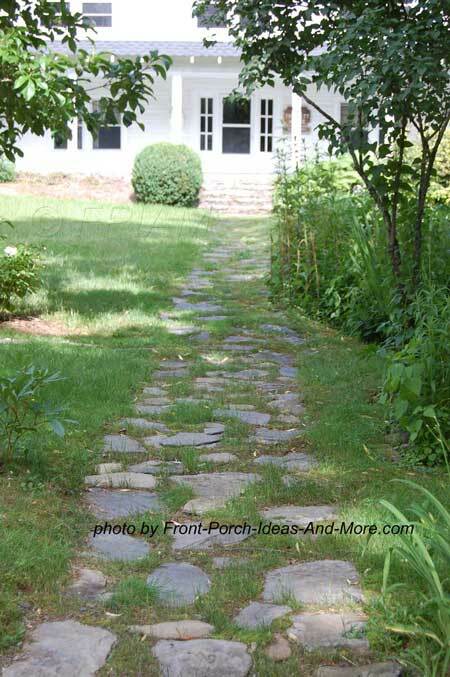 Create direction - A straight path leading right to the porch unmistakably says "this way"! Create pleasure - A walkway that meanders a bit and lined with flowers, a front-yard garden, or mulched beds tempts us to slow down a bit and enjoy the surroundings. 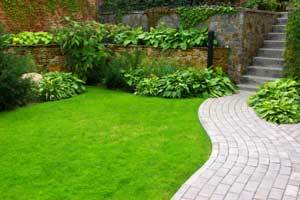 Create a mood - A walkway, even a straight one, can be embellished with a row of stones, bricks, or pavers on either side. 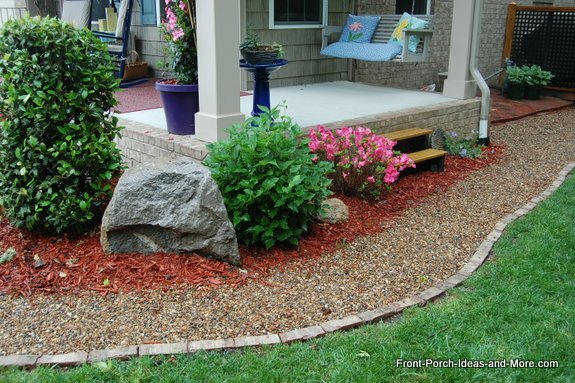 Add some ground cover that spreads over the edges to give it a softer look. Don't forget lighting! Use a variety of landscape lighting to create just the right look. 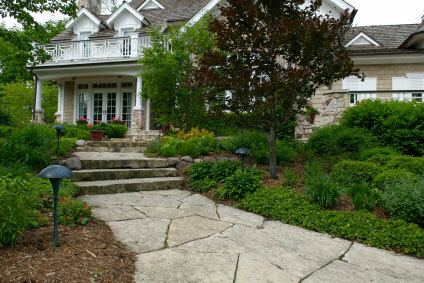 Create formality or informality - Larger traditional homes tend to have more formal walk ways. Hence, most walk ways should complement the style of home. A meandering walkway with pavers and ground covers would fit right in with a craftsman or cottage home whereas it probably would detract from a formal contemporary home. The latter requiring perhaps a straight brick-laid path surrounded with a meticulous yard. 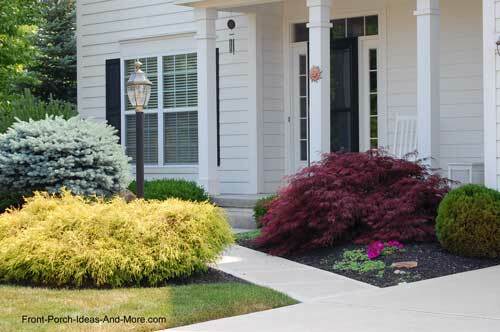 Create color- The best way to tie your landscaping to your home is through color. Make your walkway color match the color of your home; this may be easier than you would think. Most walkway materials come in many colors. You can stain concrete. 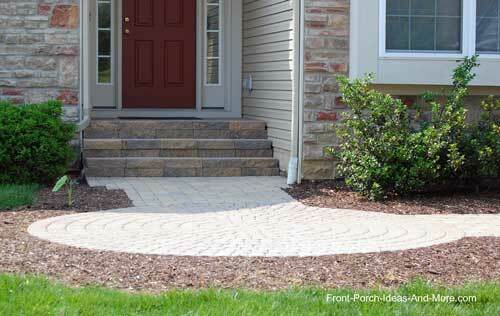 No matter your porch design, your walkway to your porch should be like a red carpet to your visitors. Use four feet as your guide; allows for two people to walk side by side. Wider walk ways may be more complementary for larger homes or those with large yards. Wide walk ways immediately tell guests which path leads to the front door. 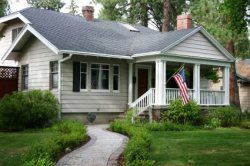 Here's a great tip for small porches and yards: A straight walkway leading directly to the porch will focus your eyes on the front door. 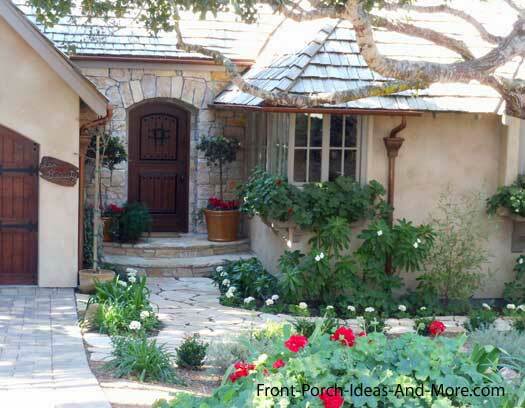 So create a pleasing walkway and use your front door as a focal point which will add interest to a small porch! Curving walk ways are pleasing to the eye and add a little mystique. They also cause you to slow down a bit so focus on adjacent landscaping. Start with the origin. Where do you and your guests park? Often times two walk ways make more sense. One from the street and another from the drive way can satisfy both requirements. Another option may be to place an additional walkway beside the drive way to the street. Use materials that provide a smooth surface for the main walkway. Bricks, poured concrete, and mortared pavers or tiles are good materials. Use loose materials for secondary paths. 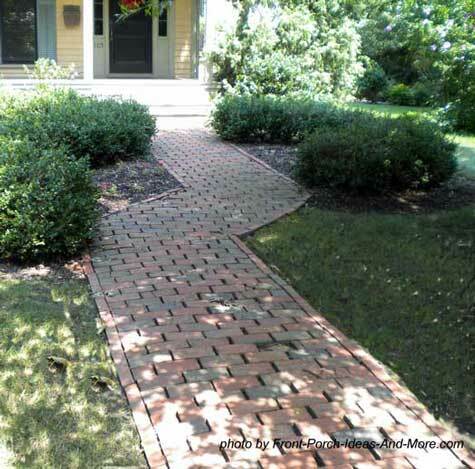 See Nicole's walkway ideas - she transformed her old walkway by installing brick walkway. Consider the weather when selecting materials. Mary and I used to have aggregate walk ways and they can be very slippery when wet and worse when icy. Besides that they aren't comfortable to walk on in bare feet. Ever see a long set of steps leading to a porch? Sometimes it can be a real climb to the top. By breaking the spacing and creating an additional landing, you make it easier for everyone plus you add extra interest. How to correct? Curve or zigzag the walkway to create multiple flat landings along the way. Check out the walkway Mary and I constructed in our yard and around our front porch; we show you how. It is easy to do and it adds both functionality and appeal. When developing these walkway ideas, we knew that accessibility and safety should definitely be addressed. Accessibility and safety are key elements in the design and construction of walk ways. Rule of thumb is no more than eight (8) steps without a landing. Make sure walk ways are well lit. 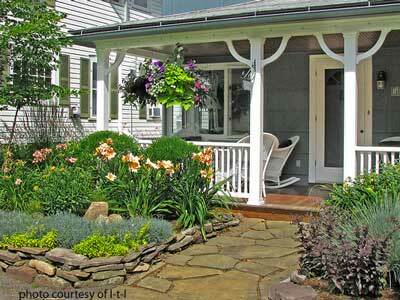 Check out our porch landscaping ideas section. When building walk ways on inclines, these are the best combinations to use: 4.5 inch rise with a 17 inch tread; a 5.5 inch rise with a 15 inch tread or a 6.5 inch rise with a 14 inch tread. Ramps can be integrated into the landscape. 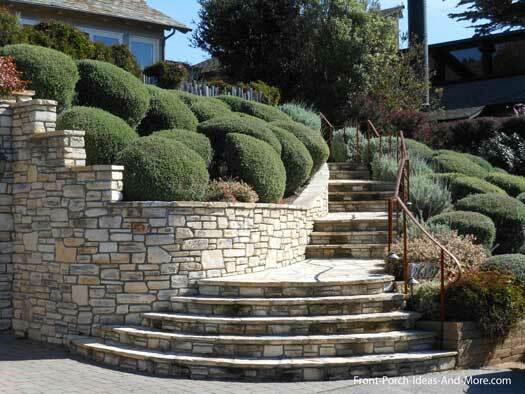 Stair step landscaping alongside the ramp and plant flowering shrubs along with ground covers to make it unobtrusive. The basic rule of thumb for ramps is that they cannot exceed a slope of 1' for every 12' or 1' for every 20' of incline. Remember that the steeper the ramp the more dangerous it becomes! Landings must be located at both the bottom and top of the ramp and each time the ramp changes direction. Each landing should have a minimum of 60" x 60" turning radius. Ramps must have handrails on both sides and extend a minimum of 12” beyond the ramp. There must also be a 2” edging along the ramp floor. Ramps must have non-slip surfaces. Visit our section on designing for wheelchair ramps for information on designs, porch lifts, and how to build a wheelchair ramp. 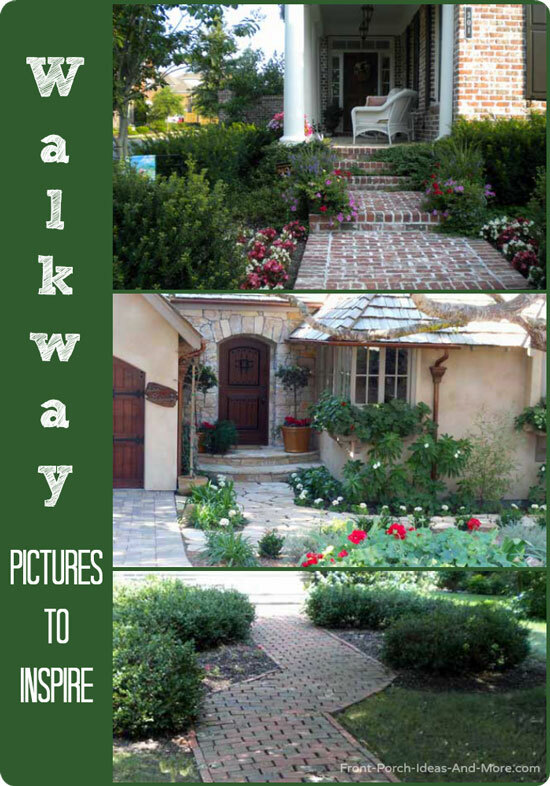 We hope these walkway ideas help you plan your own walk ways and pathways to your porch.